Glamping is one of the latest trends in camping. If you are not familiar with the term, it stands for “glamour and camping”. Glamping is especially popular in Australia because there are so many scenic spots where travelers would love to experience the great outdoors, but don’t love the idea of bush camping with limited facilities. Glamping allows travelers to experience their natural surroundings without giving up the creature comforts in order to do so. Many of the Glamping spots in Australia aim to keep eco-friendly standards with as little impact on the environment as possible while still offering holiday goers a luxury experience. Keep in mind that many of these destinations are off the beaten path and you will need a proper 4 WD vehicle to get you where you need to go safely. Paperbark Camp in Jervis Bay is an excellent example of eco-tourism combined with luxury accommodations. It is family owned and run by a family who was inspired to create the camp while on safari in Africa; as a result, your stay here is very much like a bush safari experience. Jervis Bay is about a 2 hour drive south of Sydney in New South Wales. Paperbark Camp is built there on 40 hectares of of land that is unspoilt nature at its finest. The surroundings of the campground are serene and let you be at peace with nature while enjoying luxury tent accommodations. Fine wine and excellent food is served at the restaurant. Nearby Jervis Bay has beautiful white sand beaches and you can also enjoy the clear turquoise waters of the Coral Sea. Uluru is the largest monolith rock in the world and is almost literally a centrepiece in Australia as it is close to the geographical centre of the country. This region is referred to as the “Red Centre” and is in the remote outback of the Northern Territory. Uluru and nearby Kata Tjuta are of great significance to the aboriginal people of this region and are the original land owners of Uluru-Kata-Tjuta National Park, where Longitude 131° is located. Communing with nature here also means learning about the dreaming stories and traditions from the Aboriginal people who offer tours and are the best people to tell you about the historic and cultural importance here. Staying here also affords you the benefit of arriving before most of the tourists arrive and hanging around after they leave. This means you get a pretty exclusive view of the magnificent sunrise and sunsets here. Witness the colors of the sky changing, each moment seems so different. The luxury tent accommodations are designed to be eco-friendly and have very little impact on the environment. In addition to that, the profits from the luxury tent accommodations are reinvested into the Indigenous Land Corporation’s indigenous training and development across Australia. This glamping spot is located in Queensland near Main Range National Park in the Scenic Rim. That is west of Gold Coast and south west of Brisbane close to the Queensland and New South Wales border. Here in remote seclusion on top of Spicers Peak Station are just 10 canvas tents with luxury amenities. The Scenic Rim is made up of the once active volcanic mountains of Mount Mitchell, Spicers Peak and Mount Cordeaux. Spicers Peak Station is a working Australian cattle station. Each tent features a spacious king size bed, hardwood flooring and window flaps that you can open up to see the sprawling mountain views. The eco-friendly resort is run on solar power and they have a worm farm to process waste. In addition to the tents, guests have access to the main lodge which features a fireplace and solar-powered bathrooms with hot showers. Mornington Wilderness Camp is owned and run by the Australian Wildlife Conservancy (AWC). The AWC is a non-profit and independent organization that buys up property in Australia to establish sanctuaries. 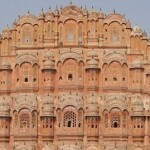 The sanctuaries then protect the habitats and the endangered wildlife species within it. They also allow a small amount of eco-tourism on each property with the provision that the conservation and protection of the land comes first. Mornington Wilderness Camp is one of these properties where you can rough it with bush camping or enjoy their luxurious glamping style accommodations like ensuite bathrooms and balconies. Mornington provides catered meals on site as well as picnic lunches to go with their guided adventure tours. Wilsons Promontory is the southernmost point on mainland Australia. It is about a 2 and ½ hour drive from southeast of Melbourne. 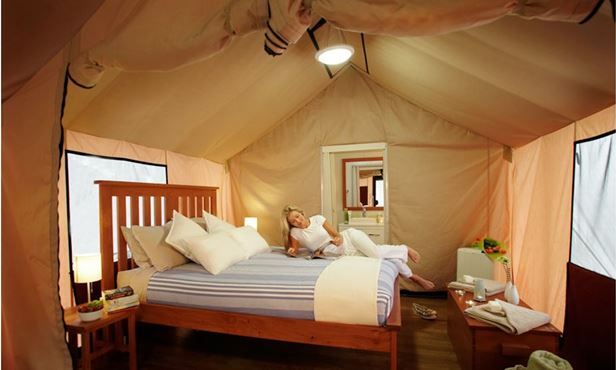 The Wilderness Retreats at Wilson’s Promontory feature luxury safari style tents. The entire retreat is eco-certified to ensure that the beautiful and varied landscapes and the animals and plants within in are all protected for generations to come. About The Author: Jason Hall is blogger and Brand Manager for Budget Trucks. He enjoys sharing tips on 4WD and tour bus travel in Australia. Delta’s New Carry-On Baggage Policy May Just Be A Winner!